Home3F IntegrationWhy Invest in Marriage? Better Family resulting in happier and healthier children growing up in a safe and secure environment due to better co-parenting. Better marriage results in better parenting. Better parenting brings about reduced tendency to be involved in crime, drug-use, and domestic violence. Better Fitness, including physical health and longevity with stronger immune system and faster recovering rate from diseases and illnesses. This includes better mental and emotional well-being among children of married couples who are less prompt to depression. Naturally, this leads to better performance at school and work. Out of the 94 couples, 75% are having “ambivalent marriages”, i.e. unions that are not bad enough to leave but still have distinctly negative attributes and do not get many of the advantages of those whose marriages are very fulfilling. Only 25% of the couples studied were genuinely happy and had no complaints. But the rest of the 75% of marriages fell into the ambivalent category where mostly their spouses were great, but there were some areas in which they were unsupportive or overly negative. If you are now among the 25% happily married couples, you are blessed with better 3F in Family, Finance and Fitness. Even as our cars require on-going servicing and maintenance so they can better serve us, our happy marriages require on-going check-up and tune-up. A happy marriage can always be happier. However, if your marriage is falling into the ambivalent category, barely surviving or struggling, it can be restored to be better so that you can begin to reap the full range of benefits associated with better marriage. In view of the above research findings, we strongly encourage you to make time and allocate money to invest into the betterment of your marriage. 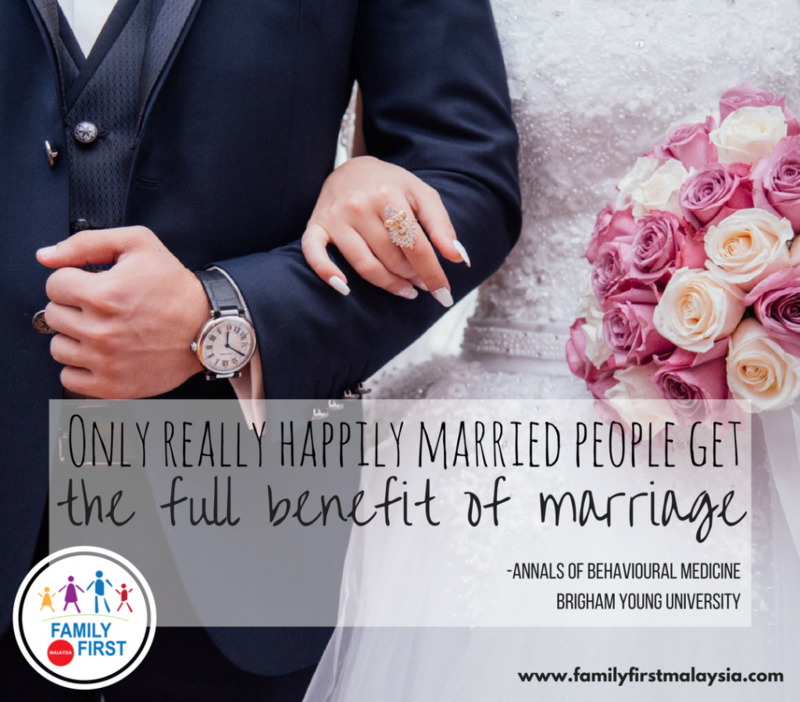 At Family First Malaysia, we have designed a 3-day and 2-night 3F Better Couple Camp, to help you get started on your journey of being a happily married couple. About the Authors: Dr Peter Ting is the President/CEO of Family First Malaysia. He and his wife, Dr Abby Ting, are committed to TRANSFORMING Next Gen Fathers, supported by Mothers, to build Better Families, resulting in a Better Workplace, a Better Society and a Better Nation. They are also co-authors of a book titled “3F Next Gen Leadership”. Since 1990, Dr Abby has tirelessly worked alongside Dr Peter to mentor their three children, Eleazar, Othniel and Nehemiah, as Next Gen Leaders empowered by 3F values. In 2014, Dr Peter retired from a full-time corporate career. Now, he uses his time to mentor Gen-Y CEO Couples and Gen-Z leaders, who are tomorrow’s entrepreneurs. Dr Abby continues to be the best helper to Dr Peter in their shared vision to reach every generation and build better families everywhere. For more about them, find their profiles on our trainers page.